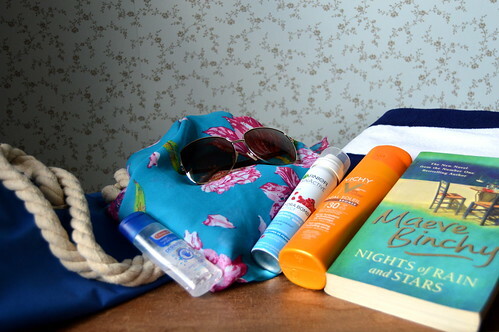 What to pack… in your beach bag! Now I’m going to be honest with you… I have never been the typical beachgoer and when we go on a holiday, we usually skip beach resorts. I can however enjoy a couple of hours at a beach club, where I can sit in the sun in all comfort… on a couch, a good read in one hand and a drink in the other! This should definitely be number one on your list as we all should really protect our skin to the maximum! When I was younger, in the eighties and nineties, it was ever so important to be as tanned as possible. Nowadays, people are much more aware and we tend to protect our skins better, just to avoid being sunburnt. 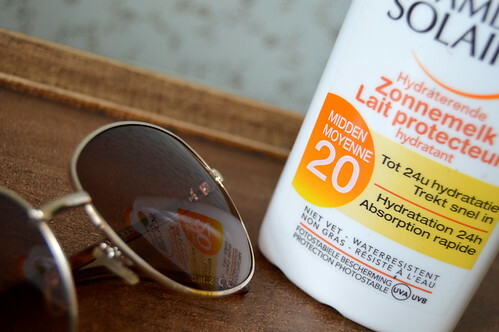 I’ve got a sensitive skin and in the beginning of summer, I use an SPF 30. Later on I can change to an SPF 20, but when going to the beach, I make sure to use the SPF 30. For my kids I always used SPF 50. 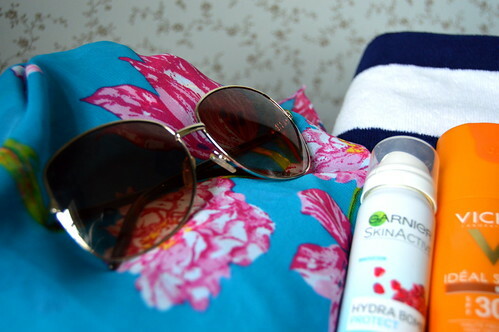 Last year I wrote a review about the Garnier-Ambre Solaire sunscreen which I liked using. Now recently I got this spray at the counter of my local drugstore (it was some sort of promotion). 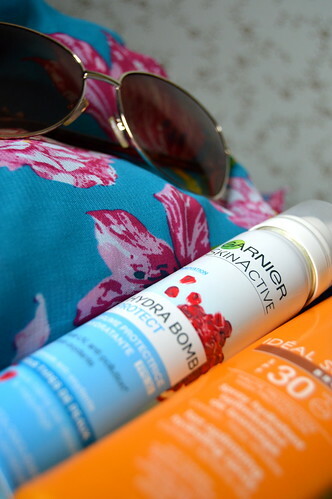 It is from Garnier SkinActive (Hydra Bomb collection) and it is a hydrating spray with an SPF 30 which you can spray on your face. You can also use it on top of your make-up. I am testing out this product for a couple of weeks and I will write a review soon! 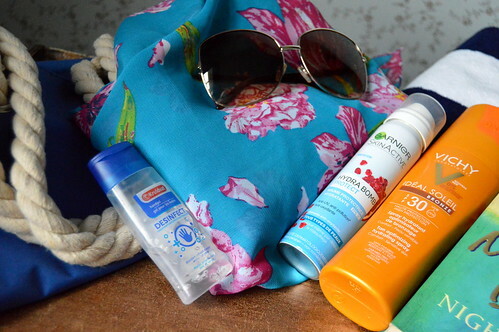 Extra tip: make sure to buy a new bottle of sunscreen each year as the effect of the protection fades after a while! If you haven’t emptied your bottle at the end of the summer, you could use it up as a body milk. I also take a small towel with me. I try to protect it from the sand when I’m on the beach so I put it in a plastic bag. Once I have left the beach, I use the small towel to wipe away the remainders of the sand which are still clinging to my body. I do not normally wear a hat on the beach. 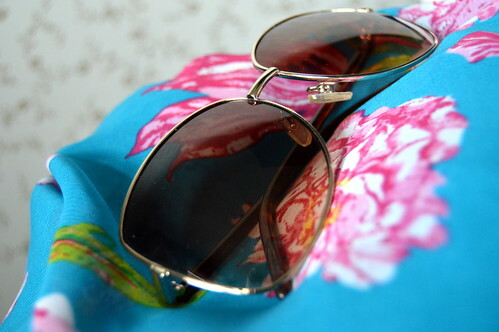 It may look trendy and summery, but I think it is just too hot! Some of you may want to wear a hat to protect themselves from having a sunstroke, but I prefer to sit under a parasol instead. Sunglasses are definitely in my bag! I use sunnies all year round actually, but when going to the beach they’re definitely on top of my list! I once had sunburnt lips which was really painful!!! “Never again”, I vowed, so now I use a lip balm which has an SPF in it. It is protective ànd it gives a nice shine to your lips… double check! I think a pareo is definitely a must, especially for the slightly older ladies like yours truly 🙂 I just don’t feel as comfortable in a bikini or bathing suit as I used to, so I have a pareo at hand to cover myself up a bit when I go and get a drink at the beach club bar! Yip… another must! I used to take wet wipes, but a desinfectant handgel is much more practical in my opinion. When your hands are greasy from the sunscreen, or when they’re covered in sand, it feels so refreshing to be able to clean them up a bit! Mind, this handgel really dries out the skin as it contains alcohol. Make sure to use a hydrating hand cream at the end of your beach day! Water! Make sure to drink plenty of water when sitting in the sun to prevent yourself from dehydrating. It’s also very refreshing to take a waterspray for your face. On the beach I obviously don’t wear make-up. But when I intend to have a bite to eat afterwards, I make sure to have the minimum of make-up with me: mascara, eyeliner, lipstick and a cushion foundation is all I need! I also make sure to have some deodorant or even better, body water with me. When going to the beach I wear a dress which is suitable for having a drink or a bite to eat afterwards. I make sure it’s a dress that I can take off easily and I wear my bikini underneath it. Have I forgotten anything?? Please feel free to add to the list! This entry was posted in Lifestyle, Personal, Travel, Travel top tips.